"Making Kids Smile One Bike At A Time." Bikes for Kids in America is a non profit organization and all donations are fully tax deductible. 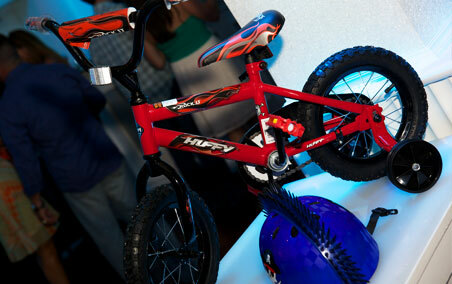 Donating a bike helps foster self-assurance and creativity amongst today's youth. Through bicycling, children in need experience the opportunities of a healthy, affordable, and eco-friendly form of transportation. "Bikes for Kids in America" accepts new and slightly used youth and adult bicycles. We also accept bicycle helmets to encourage safety and proper bicycle use. Financial Contributions: Bikes for Kids in America is a 501(c)(3) non-profit organization and all donations are 100% tax deductible. You can drop off a bike to any one of our drop off stations listed below or email us and we will pick it up from you. Please indicate on check the T-shirt sizes and colors! Web Design & Ecommerce by Logic Web Media, Inc.